Ok, so I was raving about my favorite mesh produce bags the other day, but, lest you think I work for Moukisac or something (which I don’t), I thought I’d share a little of my research into other bulk and produce bags that are available out there You know, in case you decide to go the plastic-free route. . .
First off I should say I was pretty impressed to see how many North American manufacturers there were out there keeping it local. Secondly, each bag has its own strengths and weaknesses (for example, the cotton bags are generally heavier than their synthetic counterparts, but then I’d assume they’d be biodegradable at the end of their life. . . .) but it’s fair to say they’re all better than using those flimsy ubiquitous plastic produce and bulk bags. Please note that the prices are only examples (it depends on where you buy them and there are many different sets and sizes available for each brand). In general, I think they are all competitively priced. I tried to be as objective as possible, but I’ll admit that I haven’t tried all of these brands, so feedback is welcome. Moukiesac Made in Vancouver, Canada. Polyester mesh bags with drawstrings. Mesh is fine enough for rice. not UPDATE – No Longer being made. Steward Bags Made in India through fair trade/ fair labour for a Canadian company based in Ontario. 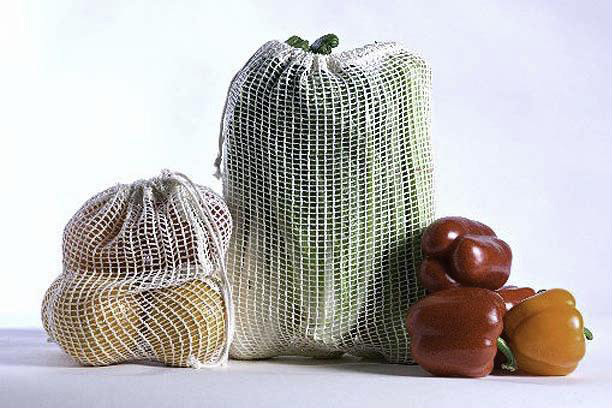 Organic cotton net sacs (loose mesh-appropriate for veggies, but too big for rice). They have drawstrings. Set of 5 produce bags $15. Ecobags Made in India or China for a New York based company. Organic cotton produce bags (opaque cloth-heavier weight but good for bulk.) or net sacs (loose mesh-appropriate for veggies, but too big for rice). They have drawstrings. Produce bags are 1.6oz (45 gr). Set of 5 produce bags $15 USD. Single net sac $4 USD. Credo Bags Made in Montreal, Canada. Cotton and organic cotton net (appropriate for veggies, but too big for rice) produce bags and muslin bulk bags (opaque cloth) with drawstrings. 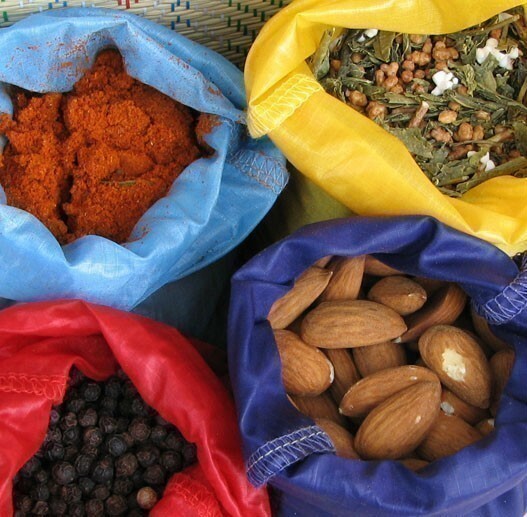 Set of 4 bulk bags is $18 CAN. Set of 4 produce bags in a gift box is $25 CAN. Kootsac Made in the Kootenays of British Columbia. Various models including nylon (great for spices and small things), silk (super light), and unbleached cotton muslin bags. No drawstrings. $13.50 for set of 4 silk bags, or $4 for one. Bag the Habit Made in Mexico for this New Jersey Company. Un-dyed, post-consumer polysester mesh bags with drawstrings. Set of 3 mesh bags $18 USD. Acme Bags Could not find where they’re made, but website says “fair labour/fair trade”. Organic cotton muslin bags (opaque cloth) or net bags (appropriate for veggies, but too big for rice) with drawstrings. Large muslin bag weighs 34g (0.09 lb), large net bag weighs= 38g (0.09 lb). Sold singly$2.95 USD for muslin and $3.95 USD for net. I have been drooling over the Moukisaks myself and will probably buy some this fall. I emailed the maker of Moukisac’s and she was looking at producing some that could hold flour, spice, and liquid! That will be an exciting moment. For our project we made some out of cotton material. I picked something that was really light and we put a little draw string in the top. I sewed some by hand earlier on and then we upgraded to a machine. You really don’t need to be a seamstress… they can be a pretty simple design. Thanks for the informative information on produce bags, the best comparison I’ve seen to date. Please correct your information -Ecobags produce bags are from overseas India or China. Thanks for the correction Judy – I changed the info in the table. And Deanna, you are definitely right that making your own bags is a great option for those of us with sewing skills. I havne’t been able to find organic cotton material in Vancouver yet – have you? Organic cotton is great but you can’t see inside your bag. Here’s another downside. Leafy greens, carrots etc. need constant moisture. A cotton will mold and break down. While there are those who hate synthetics, I grant you. Synthetics do last so very long and many are also recyclable. We make our reusables out of poly which is such a textile. Locally made, super strong and super stretchy plus you can wash produce right in the bag. Chk ’em out. Carebagsonline.com available coast to coast. I was just looking up the produce bags you mentioned at the North Van Green City Living series … and read your note from July about organic cottons, etc. I’m sure by now you have found Dream Designs on Commercial Drive (also at Lynn Valley Centre)? They carry oodles of lovely organic cottons and linens, many undyed, perfect for making little stuff sacks. Thanks for the tip Elizabeth. I do know Dream Designs, but I didn’t realize they have fabric (been out of the shopping loop for awhile). I will definitely be checkin it out! Reusable drawstring mesh produce and bulk bags. They will last you for years. Made in East Vancouver within a 2km footprint, these reusables are strong super stretchy will hold 8-10lbs each are reusable and recyclable. Check the website to see our new styles, sold at over 250 stores coast to coast including Whole Foods, Nesters, Marketplace IGA, Save On Foods, Overwaitea, Urban Fare, Drive Organics, Donald’s Markets, The Big Carrot, Pricesmart, Meinhardts, Metro Foods, Planet Organic etc etc etc. Too many stores to mention. The bags were first made back in 1990, and I still use ones from back then, now that’s quality. I’ve got many more since, as they are so useful. 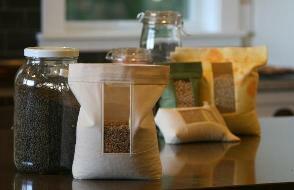 They are useful for everything and you can even store oats and granola in them. Take them to the gym and stuff your sneakers and your sweaty togs in them. 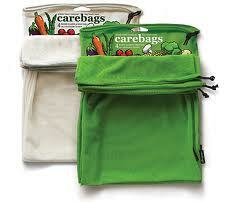 Carry your lunch, store winter bulbs, use them for travel, camping, hiking, baby toys. Canadian made quality from Carebags & Got it! Check them out for yourself. Super affordable and built to last. Thanks for the note Diana. Good tip about cotton being susceptible to mould. Not that we shouldn’t use it, just that we should be aware of the limitations of different materials. I didn’t realize carebags were now manufactured in east van. (I thought they were in the Fraser Valley). I see you also now have drawstrings which is absolutely fantastic! Keep up the good work. On another note, I recently found Kootsac for those of you in the Kootenays, so I’ll add them to the list soon too. Recently bought the silk bags from Kootsac that can be used for flour and bulk that is too fine for Carebags. Works great. Please add to the list. Done. Thanks for the tip! Well hi from Carebags. You have a picture of our originals up on your site. We no longer sell this model at all. Our bags are all draw-stringed. They come in natural and green, and we have a sister reusable bag called :Got it! reusables which is sold at mainstream grocerers. Have you seen or heard of Steward Bags? Very similar to the ones ou mentioned. Great Canadian Company. Actually, we met the Steward Bags folks at one of our screenings, and I am trying out a couple of them right now! I’ll add them to our list of options soon! I bought mesh produce bags at one point, but my veggies didn’t stay fresh in them once they were stored in my fridge. Do you store your veggies in your mesh bags too? Or do you transfer them into something else for storage? I want to get away from plastic, but I would need to solve the wiltey-veggie problem. Just wondering if anyone knows how to safely remove the mould from the organic cotton bags once a veggie has molded unnoticed and it’s grown into the bag? I’ve had the same problem! I’ve tried dishsoap, baking soda, vinegar, etc. Tips appreciated. I love all these bags!! I have been using bags I bought online from a BC company called lioli (www.lioli.ca) for two years and my bags are still in great shape. I think I prefer cotton over synthetic….it seems counter intuitive to use a man made product when we are trying to cut down on these petroleum based products for the environment. These reusable bulk bags are a great way to keep more plastic out of the landfill and I have a couple of bags that I used for my small little runs. Great list of bag companies and prices you’ve listed. Recycling is the most humane way of saving our mother Earth. Live green. So it is important that we use products such as these bulk bags or mesh bags which are recyclable to help save our nature. Less garbage means more life. Thanks for sharing this information. I cannot seem to find a way to get my hands on moukisacs! Please help! Moukiesac has been, unfortunately, discontinued. Are you based in Vancouver or somewhere else in Canada by chance?